Air Motors withstand harsh and hazardous environments. Non-lubricated Dynatork Air Motors use air supply up to 100 psi, which is controlled through integral, rotary valve. Valve sequentially directs air to 3 pistons. Pistons drive a crank that turns outlet shaft. Resulting high torque and variable low speed, with instant start/stop output, makes motors suited for paint- and other liquid-stirring applications. Housing is cast aluminum and piston is ErtalyteÂ® PETP, eliminating need for lubrication. 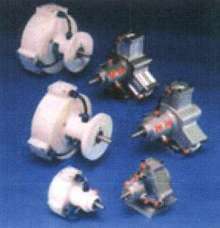 (Reading, PA, USA - Sept 5, 2003) - New non-lubricated air motors for operation in harsh and hazardous environmental conditions have been jointly developed by Dynator, Nottingham, England and Quadrant Engineering Plastic Products (QEPP). The new motors, which use components made of high-performance polymers made by QEPP, offer a power-saving alternative to electrical variable-speed and air-vane powered motors. valve. The valve sequentially directs air on to each of three pistons. The pistons drive a crank that imparts a turning motion to the motor's outlet shaft. The resulting high-torque and variable low-speed, with instant start/stop-output, makes the Dynatork Air Motor suitable for a wide variety of industrial applications. The air motor is particularly useful in paint- and other liquid-stirring applications, employed in many industries. In the automotive industry, a paint-plant recently converted its air-vane motors to Dynatork Air Motors, in order to achieve greater reliability at its 24/7-plant. The switch to the air motors, which run without any lubrication, avoids paint contamination from lubricants. The plant also now uses much less air to power its 42 paint-stirring units: 1,240 scfm less. In effect, the switch to the Dynatork Air Motors is equivalent to adding two 600-scfm compressors. Further, the savings in compressed air results in a power saving of 152 kva. The success of the new Dynatork Air Motor is largely due to their use of two materials, from Quadrant Engineering Plastic Products. For the piston, Ertalyte® polyethylene terephthalate (PETP) provides excellent dimensional stability in wet-air operating conditions. Also, the use of Ertalyte PETP eliminates the need for lubrication (silicone lubricants cannot be used in spray-paint shops), and the pistons made of PETP are quiet-running. For the cylinder liner, Ertalyte® replaces brass components. This results in closer dimensional control, which improves piston-sealing efficiency. While standard Dynatork Air Motors use high-quality cast aluminum for the body housing, an alternative design has housings made of porosity-free Acetron® acetal copolymer. The use of this material allows to the air motors to meet the regulations of the FDA and EU. The Quadrant Engineering Plastic Products group is comprised of the former DSM Engineering Plastic Products businesses, formed by merging market leaders Polymer Corporation and Erta. Full support in evaluating designs and machining of parts is available from Quadrant Engineering Plastic Products' Technical Support Group. Learn more about Quadrant at www.quadrantepp.com. Acetron, Duraspin, Duratron, Ertalyte, Extreme Materials, Fluorosint, Ketron, MC, Nylatron, Nylasteel, Polypenco, Semitron, Techtron and Vibratuf are registered trademarks of the Quadrant Group of Companies.